Originally published in the WHO Goodwill Ambassador’s Newsletter for the Elimination of Leprosy, Issue No. 42 (February 2010). The information was correct and current at the time of publication. When National Forum President Dr. P.K. Gopal was planning the southern regional conference in Chennai, he turned to an old acquaintance to organize media coverage. Some 30 years ago, K.N. 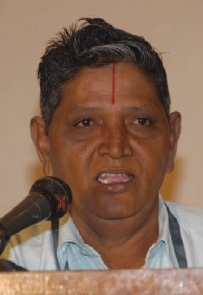 Madhavachari (pictured) was a young man undergoing treatment at Sacred Heart Leprosy Centre in Kumbakonam, Tamil Nadu, where Gopal was employed as a social worker. Seeing something in Madhavachari, he urged him to get a qualification. Initially reluctant to leave the hospital, Madhavachari had to be pushed to go to Chennai in 1979 to be trained in printing under a rehabilitation program. But once there, he never looked back. “He had an opportunity and he used it well,” says Dr. Gopal. Today, 63-year-old Madhavachari radiates a bullish confidence in himself and his abilities. “I’m a very proud man,” he says. “You could say I have a superiority complex.” After studying printing he went on to work for leading publications, also trying his hand at advertising and journalism. Now he runs his own design and printing company, while also free-lancing as a reporter. Madhavachari has two brothers, one of whom, like him, is a person affected by leprosy. Without children of his own, Madhavachari is supporting his affected brother’s five daughters, funding their education, helping find them work and marriage partners.